This little Dumbo-dig at the Oceanic whitetip has nothing to do with the earlier strip. The shark isn't at all upset that the stripey fish don't want to hang out with it. Oceanic whitetip sharks are pretty awesome. They have these special (aka "conspicuously larger an rounded") fins and they look rather cool swimming about with their groupies. Sadly, they have been the victims of over-fishing because some people think cool fins = tasty fins. 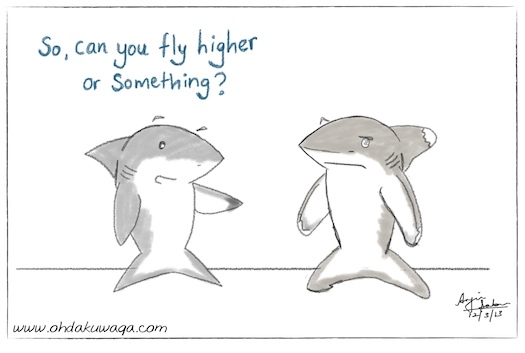 The possibility that those fins are to help the shark fly higher never crosses their mind. Thankfully, CITES delegates voted for their protection this year.